The aim of our study was to compare the safety, tolerability, and effectiveness of treatment with either intravenous (i.v.) ferrous sucrose or oral ferrous sulfate on postpartum iron deficiency anemia. Iron deficiency anemia is very common in women postpartum and oral ferrous sulfate has been considered the standard of care. However, parenteral iron treatment is expected to be advantageous in cases where oral iron is not possible due to poor compliance or gastrointestinal side effects. The patients of the study (100 patients) were randomly divided into two groups (50 patients/group) using a computer-generated randomization schedule. The first group consisted of 50 women (i.v. group) who received iron by the i.v. route and the second group consisted of 50 women (oral group) who received iron by the oral route, two capsules daily 150 mg twice daily for 6 weeks. The serum ferritin level, hemoglobin (Hb) level, and red blood cell indices hematocrit, mean corpuscle volume, and mean corpuscular Hb concentration data were collected at home 0, 5, 14, 40 days after treatment. The current study showed that i.v. ferrous sucrose significantly increases the mean level of Hb from 7.9 mg/dl at pretreatment to 11.5 mg/dl at 40 days after treatment, whereas oral ferrous sulfate increases the mean level of Hb from 7.8 mg/dl pretreatment to 11.2 mg/dl; these results showed that i.v. iron is more effective than oral iron regarding the increase of Hb level. The present study concluded that i.v. ferrous sucrose increases the Hb level more rapidly than oral ferrous sulfate in women with postpartum iron deficiency anemia; it also appears to replenish iron stores more rapidly without any significant side effects. Iron-deficiency anemia (IDA) is very common in women postpartum and oral ferrous sulfate has been considered as the standard of care . However, parenteral iron treatment is expected to be advantageous in cases where oral iron is not possible due to poor compliance or gastrointestinal side effects . Postpartum anemia, defined by the WHO as a hemoglobin (Hb) level below 11 g/dl is very common, usually resulting from a combination of blood loss at delivery and pre-existing iron-deficiency anemia. Postpartum Hb levels of less than 10 g/dl are observed in up to 30% of women, with more severe anemia (Hb <8 g/dl) seen in 10% . Iron deficiency is the principal cause. This is partly attributable to an iron deficit during pregnancy caused by the increased iron demands of the fetoplacental unit and an increased maternal red cell mass . From the previous studies Bhandal and Russell , Perewunsnyk et al. and Jain et al. , it was found that treatment with intravenous (i.v.) iron sucrose increases the Hb concentration by 25% by day 5. The aim of our study was to compare the safety, tolerability, and efficacy of treatment with i.v. ferrous sucrose or oral ferrous sulfate for postpartum iron-deficiency anemia. 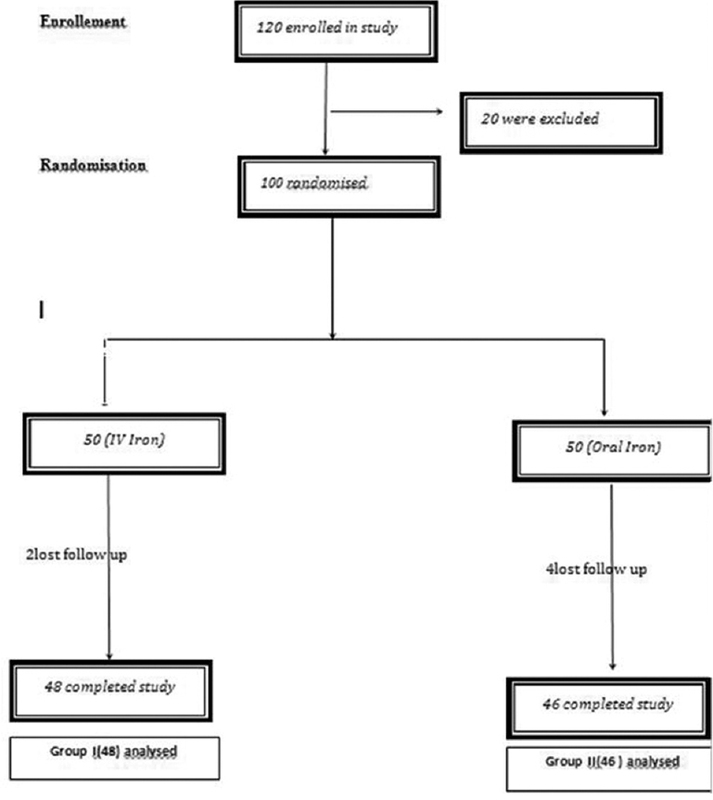 A prospective randomized study that was conducted at the labor ward of the department of Obstetrics and Gynecology, Shebin El-Kom Teaching Hospital, to compare the efficacy, safety, tolerability, and side effects of i.v. ferrous sucrose and oral ferrous sulfate in the management of postpartum iron-deficiency anemia. Local ethics committee approval and written consent from all women were obtained before participation in the study. The study was conducted at Shebin El-Kom Teaching hospital over 10 months from February 2015 to December 2015. To detect an increase with 90% power at the 5% significance level with 95% confidence interval, we calculated that 50 patients were needed to be recruited to each group; a total 100 anemic postpartum women were included in this study. The patients of the study (100 patients) were randomly divided into two groups (50 patients/group) using a computer-generated randomization schedule. Group I was treated by i.v. ferrous sucrose. Group II was treated by oral ferrous sulfate. The women were randomized to one of two groups using a computer-generated randomization schedule. After obtaining written consent, the women were prescribed treatment with either i.v. ferrous sucrose (group I) or oral ferrous sulfate (group II). Women aged 18 years or more, with postpartum iron-deficiency anemia (defined as Hb ≤9 g/dl and serum ferritin <15 μg/1 at 24–48 h after delivery). Women with severe anemia (Hb <7 g/dl), women with anemia due to causes other than iron deficiency, history of blood transfusion, iron intolerance, women with signs of infection or evidence of renal or hepatic dysfunction and history of asthma, thromboembolism, seizures, previous iron therapy during pregnancy, chronic uncontrolled systemic diseases such as hypertention and diabetes mellitus were excluded. In the initial visit, written consent was obtained and the patients were counseled about the iron therapy, its benefits, and risk of discontinuation. Blood sample was taken at recruitment into the study, day 0, day 5, day 14, and day 40 of therapy. These time points were chosen on the basis of previous studies and to minimize inconvenience to women. The time points were also chosen to detect any difference in the speed of restoration of HB% and iron stores. A sample of 2 ml venous blood was collected in EDTA vacutainers. The device used was Urit-2900plus; Urit Medical Electronic Co. Ltd. Guilin. Guangxi 541004.P.R. China. A sample of 2 ml venous blood was collected in serum vacutainers and the separated sera were stored at 20°C until the time of assay by turbidimetric technique. The device used was X52/107PM; Lavite Co. Ltd, Germany. C-reactive protein using latex at each time point to exclude artificial elevation of serum ferritin due to acute inflammatory response. Treatment was started at 24–48 h after delivery. Women were randomized either to group I, where th ey recei ved three doses of i.v. ferrous sucrose (Sacrofer; Amoun Co., Egypt; El Obour city – Cairo – Egypt) given every alternate day for 3 days after recruitment or to group II, where they received oral ferrous sulfate 150 mg twice daily with two capsules daily (Ferrofol capsules; Eipico, Egypt' 10th Of Ramadan City, Industrial Zone B 1) for 6 weeks. In group I, the ferrous sucrose (Sacrofer; Amoun Co.) was administrated in the labor ward in the Department of Obstetrics and Gynecology at Shebin El-Kom Teaching Hospital, as an i.v. infusion in 250 ml of 0.9% sodium chloride slowly over 30 min, and then discontinued for another 30 min to detect any hypersensitivity reactions with monitoring of vital signs during infusion; antishock measures were prepared beside the patient during administration (corticosteroids, antihistaminic, calcium, and oxygen). Patients were asked to note any symptoms or adverse effects of treatment such as facial flushing, nausea, metallic taste, dyspepsia, and burning at the injection site. The dose was calculated by means of the formula total required iron in mg = 2.4 × W × deficit, where W is the body weight in kg, and deficit is the target Hb minus actual Hb in g% (target Hb: 12 g%) . The total required dose of iron was divided into three doses, which were given every alternate day, and the maximum daily dose was three ampoules of 250 mg. This group received no further iron supplementation. They were asked to note any symptoms or adverse effects of treatment. In group II, the women were advised to take 150 mg ferrous sulfate (Ferrofol capsules; Eipico) twice daily (two capsules) with meals for 6 weeks from the day of recruitment. Date was given when to stop oral supplementation after 6 weeks; this group was advised to note side effects such as nausea, metallic taste, dyspepsia, and constipation. We added 500 μg of folic acid orally to patients of the group 1 (i.v. iron) twice daily for 6 weeks to eliminate the differences in the results between the groups as Ferrofol (oral iron for second group) contains 500 μg folic acid. All statistical data at each of the three postbaseline assessment times were analyzed by analysis of covariance. The analyses were conducted using computer programs Microsoft excel 2003, and SPSS for Microsoft windows, version 10 (SPSS Inc., Chicago, Illinois, USA). Data were statistically described in terms of mean ± SD for comparison between the i.v. group and the oral group at time 0, 5, 14, and 40 days after treatment. For quantitative data, we used the Student t-test, and for qualitative data we used c 2-test. Difference in variables was expressed by P value: P value less than 0.05 was considered statistically significant, less than 0.01 was highly significant, and more than 0.05 was not significant). A total of 120 anemic postpartum patients were assessed for eligibility, written consent was obtained after exclusion of 20 patients, and 100 patients were randomized into two groups. The first group consisted of 50 women (i.v. group) who received iron by the i.v. route, in the form of standardized aqueous alkaline solution of iron hydroxidesaccharate complex (iron saccharate) (Sacrofer; Amoun Co.) (30 ferrous sucrose). The second group consisted of 50 women (oral group) who received iron by the oral route, in the form of ferrous sulfate capsule (Ferrofol capsules; Eipico). Two capsules 150 mg twice daily for 6 weeks. Data were collected from 48 patients from the first group (i.v. group) and two patients were lost to follow-up. From the second group, (oral group) data were collected from 46 patients and four patients were lost to follow-up [Figure 1]. Figure 1: Patient's progress through the randomized study. 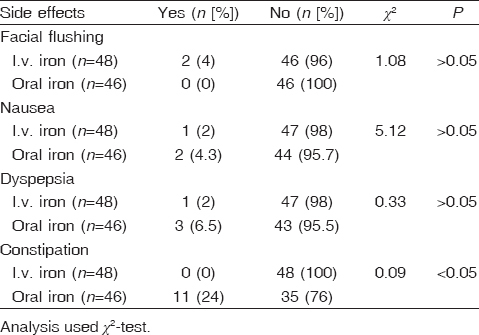 Differences in variables w ere expressed by P value: P value less than 0.05 was considered statistically significant, less than 0.01 was highly significant, and more than 0.05 was not significant [Table 1] and [Table 2]. The current study showed that i.v. ferrous sucrose significantly increases the mean level of Hb from 7.9 g/dl at day 0 to 9.9 g/dl at day 5, 11.2 g/dl at day 14, and 11.5 g/dl at day 40 after treatment, whereas oral ferrous sulfate increases the mean level of Hb from 7.8 g/dl at day 0 to 8.4 g/dl at day 5, 9.1 g/dl at day 14, and 11.2 at day 40; the mean change in Hb level from the baseline at day 40 was 3.6 g/dl in the i.v. iron group and 3.4 g/dl in the oral iron group; these results showed significant differences between the two groups and proved that i.v. 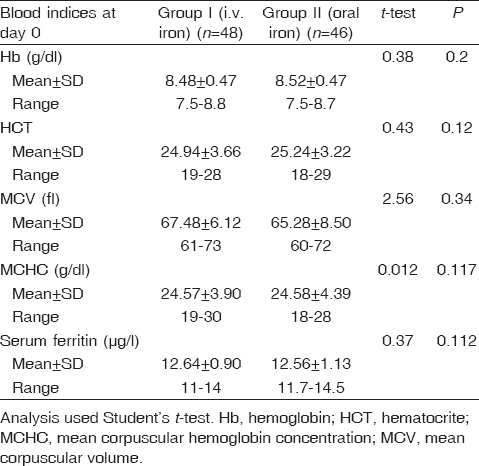 iron was more effective and more rapid than oral iron regarding the mean increase in Hb level from the baseline level as in [Table 3] and [Figure 2]. Figure 2: Hemoglobin levels at 0, 5, 14, and 40 days after treatment in both groups of the study. 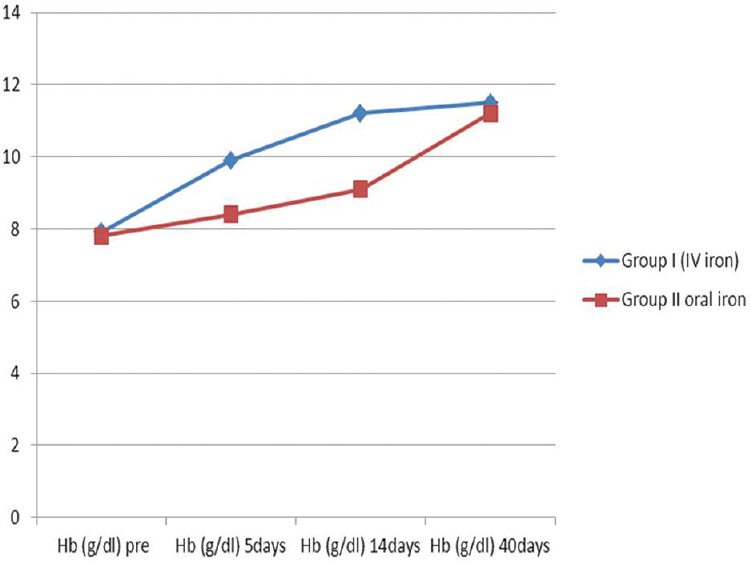 Hematocrit (HCT) at 5 and 14 days was higher in the first group (i.v. 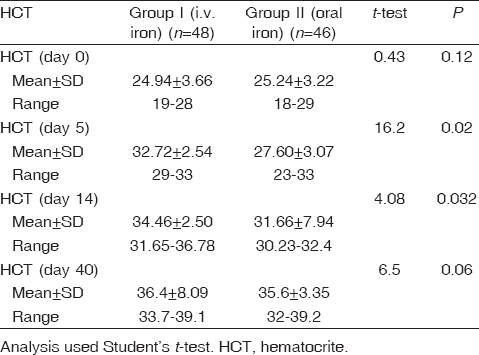 iron) than in the second group (oral iron) and no significant differences were noticed at 40 days after treatment in both groups of the study [Table 4]. We observed that i.v. ferrou s sucrose replenished iron stores within 5 days in the first group (i.v. iron), which was more rapid than in the second group (oral iron), as our finding showed that the mean level of serum ferritin was significantly higher in the first group (from 12.5 to 45 μg/l) than in the second group (from 12 to 17 μg/l) at day 5 after treatment as in [Table 5] and [Figure 3]. 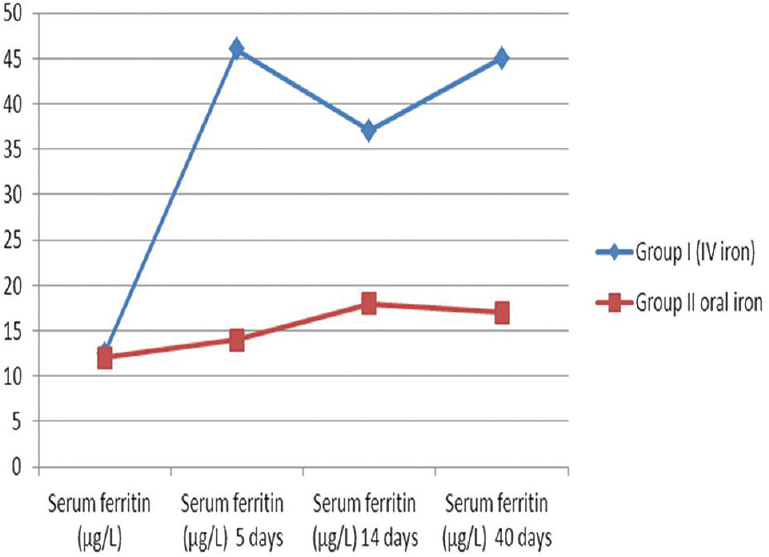 Figure 3: Serum ferritin at 0, 5, 14, and 40 days after treatment in both groups of the study. The mean change from the baseline of Hb and serum ferritin at days 5 and 14 was higher in the first group on i.v. 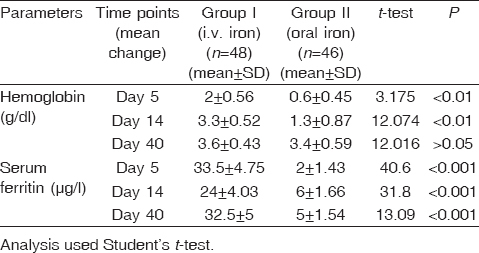 iron than in the second group on oral iron and there was no significant difference at 40 days after treatment in both groups of the study [Table 6]. Gastrointestinal side effects were higher in the second group (oral iron) than in the first group (i.v. iron) [Table 7]. IDA is very common in women postpartum and oral ferrous sulfate has been considered as the standard of care. However, parenteral iron treatment is expected to be advantageous in cases where oral iron is not possible due to poor compliance or gastrointestinal side effects, where it can provide greater and more rapid iron supply than oral iron supplementation . Our study was performed to ascertain whether administering i.v. ferrous sucrose to women with postpartum anemia results in higher Hb concentration and improved iron stores than using standard treatment with oral iron. Serum ferritin was used as an indicator of iron storage. Although serum ferritin levels are low in pregnancy due to plasma dilution, serum ferritin remains a reliable indicator of iron deficiency, where a cut-off level of less than 15 μg/l is used . The current study showed that i.v. ferrous sucrose significantly increases the mean level of Hb from 7.9 g/dl at day 0 to 9.9 g/dl at day 5, 11.2 g/dl at day 14, and 11.5 g/dl at day 40 after treatment, whereas oral ferrous sulfate increases the mean level of Hb from 7.8 g/dl at day 0 to 8.4 g/dl at day 5, 9.1 g/dl at day 14, and 11.2 at day 40; the mean change in Hb level from the baseline at day 40 was 3.6 g/dl in the i.v. iron group and 3.4 g/dl in the oral iron group; these results showed significant differences between the two groups and proved that i.v. iron was more effective and more rapid than oral iron. Our study results were in harmony with those of Kanwal et al. who studied 322 patients with postpartum iron-deficiency anemia, divided into two groups (i.v. iron and oral iron), and reported that i.v. ferrous sucrose increased Hb level from 7.2 to 11.49 g/dl at day 40, whereas oral ferrous sulfate increased levels from 7.1 to 11.17 g/dl, thus proving that i.v. iron was more effective than oral iron. The mean increase in Hb level at day 14 in our study is supported by the study conducted by Broche et al. in which the mean increase in Hb by day 14 was higher in the i.v. group (3.1 g/dl) than in the oral group (1.9 g/dl). Similarly, Jain et al. studied 40 patients with postpartum IDA who were divided into two groups. The i.v. group was treated with i.v. iron sucrose (300–600 mg) and the oral group was treated by ferrous fumarate 300 mg once daily for 14 days; on day 14, the increase in mean Hb in the i.v. group was higher (2.4 g/dl) than that in the oral group (1.2 g/dl), suggesting that i.v. iron sucrose increased the Hb level more rapidly than oral ferrous fumarate in postpartum anemia without any serious side effects. In contrast to the current study, Westad et al. studied 128 postpartum anemic women (with Hb levels between 6.5 and 8.5), who were randomized into a first group that received 600 mg i.v. ferrous sucrose followed by 100 mg oral ferrous sulfate twice daily for 4 weeks, and the second group that received 100 g oral ferrous sulfate twice daily for 4 weeks; this study reported that there was no significant difference in the improvement in Hb levels after 4 weeks as it was 12 g/dl in the i.v. iron group and 11.9 in the oral iron group. Recently, Perello et al. , who studied 72 postpartum anemic women with severe anemia (Hb levels between 6 and 8 g/dl), were randomized into a first group that received i.v. ferrous sucrose 200 mg for 2 days in addition to two oral ferrous sulfate tablets daily with elemental iron 105 mg for 30 days, and the second group that received i.v. placebo in addition to oral ferrous sulfate at the same dose as the first group; this study observed that when i.v. iron was added to oral iron therapy, there was no significant difference over placebo in the Hb level after 6 weeks. The mean increase in the Hb level in our study is not matched with that in previous studies by Westad et al. and Perello et al. ; their finding was explained using oral iron concurrently with i.v. iron, and they studied patients with severe postpartum anemia with Hb levels between 6.5 and 8.5 in Westad et al. , and between 6 and 8 in Perello et al. ; they also suggested that gastrointestinal absorption of oral iron increased with severe anemia. We observed that i.v. ferrous sucrose replenished iron stores within 5 days in the first group (i.v. iron), which was more rapid than in the second group (oral iron), as our finding showed that the mean level of serum ferritin was significantly higher in the first group (from 12.64 to 44.14 μg/l) than in the second group (from 12.56 to 14.59 μg/l) at day 5 after treatment. Our study results coincide with those of the study conducted by Bhandal and Russell , on 44 women with postpartum IDA anemia, who were randomized into two groups: the i.v. group, which received i.v. ferrous sucrose 200 mg on days 2 and 4 after recruitment and the oral group, which received oral ferrous sulfate 200 mg twice daily for 6 weeks; this study showed that rapid and profound response can be directly attributed to a high amount of iron that could be delivered directly to the hemopoietic tissues, which in turn restores iron reserves. Similarly, the study conducted by Breymann et al. on 349 anemic postpartum women who were randomized into two groups (the first group treated by i.v. ferric carboxymaltose and the second group by oral ferrous sulfate 100 mg twice daily for 12 weeks) reported that iron carboxymaltose was more effective than oral iron sulfate in changing Hb level and rapidly restoring iron storage. Recently, in a similar study by Becuzzi et al. on 150 women with postpartum (IDA) who received oral iron sulfate 80 mg elemental iron once daily for 6 weeks and 77 who women receiv ed a single dose of i.v. iron carboxymaltose, the data analyzed after 6 months showed that i.v. iron supplementation was the more effective approach for long-term iron store replenishment. Although Westad et al. and Perello et al. reported that there was no significant difference between i.v. 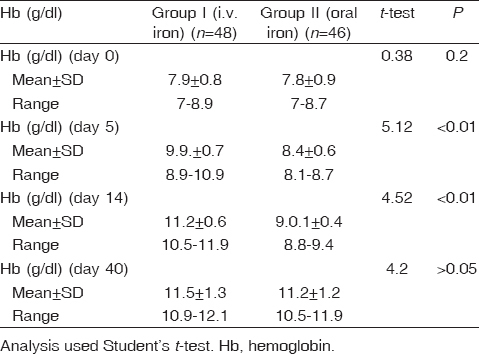 iron and oral iron in terms of the increase of Hb level, they also found that i.v. 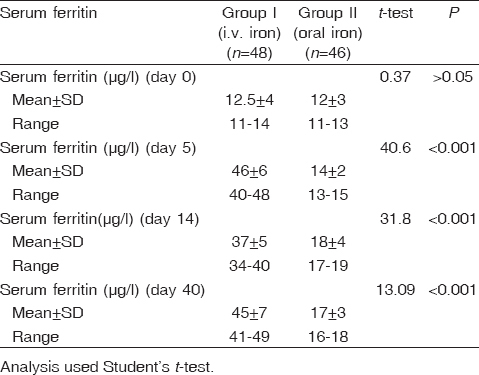 iron increases serum ferritin levels more rapidly than oral iron at day 5 after treatment. The results of our study showed a significant difference between the two groups of the study in red blood cells indices (HCT, MCV, and MCHC), which were higher in the first group (i.v. iron) compared with the second group (oral iron) after day 40 from treatment. According to Verna et al. who studied 150 women with postpartum anemia (Hb <8 g/dl) randomized into a first group treated by i.v. ferrous sucrose 600 mg and a second group treated by oral ferrous sulfate 200 mg twice daily for 4 weeks, the results of this study reported that HCT, MCV, and MCHC were higher with i.v. iron sucrose than with oral ferrous sulfate after 6 weeks; hence, our study matched with these results. Also, Bhandal and Russell  reported that HCT, MCV, and MCHC were higher with i.v. ferrous sucrose than with oral ferrous sulfate at 40 days after treatment. Similarly, Giannoulis et al. and Van Wync et al. concluded that i.v. iron was superior in the efficacy than oral iron in increasing Hb level and red blood cell indices HCT, MCV, and MCHC; hence, our study is in agreement with these studies. Regarding the incidence of side effects of the drugs in our study, it was 8.1% in the first group (i.v. 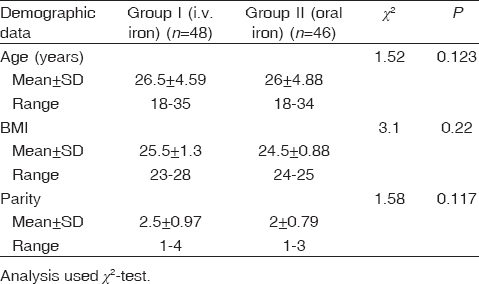 iron) and 17.2% in the second group (oral iron); we found a significant difference in the incidence of gastrointestinal symptoms in the oral group, whereas in the i.v. group, iron appeared to be safer without any serious side effects. We also observed that i.v. ferrous sucrose was well tolerated and not associated with any serious adverse effects. This finding is supported by previous larger studies that had investigated the safety profile of i.v. ferrous sucrose both during pregnancy and in postpartum period . In our study, we observed that the high tolerance of ferrous sucrose has been partly attributed to slow release of iron from the complex and also due to the low allergenicity of sucrose. Our finding is supported by the study conducted by Jain et al. , Kanwal et al. and Becuzzi et al. , who observed that i.v. iron was safer and more tolerable without serious side effects compared with oral iron. Similarly, Perewunsnyk et al. studied 400 postpartum anemic patients who received a total of 2000 ampoules of ferrous sucrose, and found that minor general adverse effects including a metallic taste, flushing of the face, and burning at the site of injection occurred in 0.5% of the cases with doses up to 200 mg. In our study, we found that compliance with oral treatment was good and reinforced by regular visits and verbal contact with the patients under the study and this contrasts with compliance findings described in the study conducted by Al-Momen et al. , in which they found gastrointestinal adverse effects with frequencies up to 30% in the women who were treated with oral iron; this finding was explained by the higher dose of oral ferrous sulfate (300 mg three times daily for 8 weeks) in women less than 32 weeks pregnant. Also, Perello et al. reported that i.v. iron added to oral iron therapy did not show significant benefits over the placebo added to oral iron therapy in terms of symptoms or adverse effects. This was because they used a limited dose of i.v. ferrous sucrose. In the future, hepcidin measurement may allow a more accurate assessment of the degree of iron overload and maldistribution of iron in iron overload patients . Our study illustrates clearly that i.v. ferrous sucrose is safe, convenient, and effective without serious side effects in the treatment of postpartum iron-deficiency anemia as compared with oral ferrous sulfate. This rapid and profound response was directly related to the high amount of iron that could be delivered directly to the hemopoietic tissues. Ferrous sucrose appears to be effective because it is rapidly removed from the plasma and used for erythropoiesis. The present study concluded that i.v. ferrous sucrose increases the Hb level more rapidly than oral ferrous sulfate in women with postpartum iron-deficiency anemia; it also appears to replenish iron stores more rapidly without any significant side effects. However, more studies will be needed for the evaluation of the effect of iron administration on the iron stores in the maternal body after delivery. Milman N. Postpartum anemia II: prevention and treatment. Ann Hematol. 2012 Feb;91(2):143-54. doi: 10.1007/s00277-011-1381-2. Epub 2011 Dec 9. Review. Atkinson LA, Baxley EG. Postpartum fatigue. Am Fam Physician 2004; 50:113–18. Agget P. Iron and women in the reproductive years. In: British Nutrition Foundations Tasks Force, editors. Iron nutritional and physiological significance. 1st ed. London: Chapman and Hall; 2005. pp. 110–118. Baker W. Iron deficiency in pregnancy, obstetrics, and gynecology. Hematol Oncol Clin North Am 2000; 14:1061–1077. Bhandal N, Russell R. Intravenous versus oral iron therapy for postpartum anemia. BJOG 2006; 113:1248–1252. Perewunsnyk G, Huch A Breymann C. Parenteral iron therapy in obsteries: 8 years experience with iron-sucrose complex. Br J Nutr 2002; 88:3–10. Jain G, Palaria, Jha SK. Intravenous iron in postpartum anemia. J Obstet Gynecol India 2013; 63:45–48. Kanwal A, Shadab W, Rehman A. To evaluate safety and efficacy of intravenous iron versus oral iron for postpartum anemia. JSOGP 2013; 3:223–226. World Health Organization. The prevalence of anemia in women Geneva: World Health Organization; 2010. pp. 1–99. Broche D-E, Guy C, Amand-Branger S, Grangeasse L, Terzibachian J-J. Acute postpartum anemia. Clinical practice and interest of intravenous iron. Gynecol Obstet fertile 2004; 32: 613–619. Westad S, Baker B, Salvensen KA. A 12 week randomized study compared intravenous ferrous sucrose versus oral ferrous sulfate for treatment of postpartum anemia. Acta Obstetricia Gynecol Scand 2008; 87:916–917. Perello MF, Coloma JL, Masoller N, Palacio M. Intravenous ferrous sucrose versus placeboin addition to oral iron therapy for treatment of severe postpartum anemia, a randomized controlled trial. BJOG 2014; 121:706–707. Breymann C, Gliga F, Strizhova N, Bejenariu C. Comparative efficacy and safety of intravenous ferric carboxymaltose in treatment of postpartum anemia. Int J Gynecol Obstet 2008; 101:67–73. Becuzzi N, Zimmermann R, Krafft A. Long term efficacy of postpartum intravenous iron therapy university hospital, 8091 Zurich, Switzerland. BioMed Res Int 2014; 3:113–115. Verna S, Inamdar SA, Malhotra N. Intravenous iron therapy versus oral iron in postpartum patients in rural area. JSAFOG 2011; 3:67–70. Giannoulis C, Danilidis A, Tantanasis T, Dinas K. Intravenous administration of iron sucrose for treating anemia in postpartum women, Hippokratia 2009; 13:38–40. Van Wyck DB, Martens MG. Intravenous ferric carboxymaltose compared with oral iron in treatment of postpartum anemia, a randomized controlled trial. Obstet Gynecol 2007; 10:267–278. Al-Momen AK, Al-Meshari A, Al-Nuaim L, Saddique A, Abotalib Z, Khashogji T. Intravenous iron sucrose complex in the treatment of iron deficiency anemia during pregnancy. Eur J Obster Gynecol Reprod Biol 1996; 69:121–124. Rashidy FH, Abo Elghar HM, Kamal Eldin SM, Taha MZ. Hepcidin and iron regulation in chronic hemolytic anemia. Menoufia Med J 2015; 28:463–467.